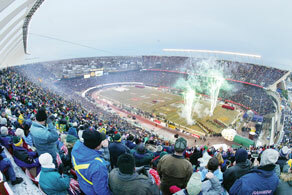 Join football fans from across the nation for the 106th Grey Cup Festival! Festivities begin Wednesday evening (Nov 21) with the Tim Horton’s Kick-Off Party, located along Jasper Ave. Expect free entertainment, family activities lining the street, and a whole lot of spirit! Welcome to the biggest party of the year. Check out the Nissan TITAN Street Festival where you’ll find ongoing entertainment for all ages, the Outdoor Tailgate Party, The Brick Family Zone where kids can enjoy interactive games and activities, and the Cooper Entertainment Stage which will host a range of musical groups throughout the festival. Warm up inside the Shaw Conference Centre with great events like the Cheer Extravaganza, where CFL Cheer Teams from across the league perform exhilarating routines, and the Coors Light Concert, featuring some of Canada’s top talent! Start your day with pancakes at the Spirit of Edmonton Breakfast Friday and Saturday while taking in exciting entertainment from CFL Cheer Teams and bonding with fellow CFL fans. Too late for breakfast? Grab a pint and a bite at the Boston Pizza Sports Bar, or check out the Indoor and Outdoor Tailgate Parties! Thrilling activities for both kids and adults will be housed in the Live Active Edmonton Park. You’ll feel like you’re at a ski hill in Edmonton’s own river valley on the Jiffy Lube Tube Slide, and EPCOR Street Ski both new to this year’s festival. Also making its debut is the six-storey Bungee Jump. The Capital Power Zipline a popular returning attraction, gives you the chance to fly 520 feet across the festivities from 80 feet above. To warm up, check out the new Esports Tournament, where teams will compete in the popular ‘League of Legends’ game, or visit the Syncrude Mini Field where you or your kids can join a game of football, open daily from 11 am to 11 pm. LASTLY: Don’t miss the Grey Cup Parade passing through Jasper Ave. Saturday afternoon. WHERE Edmonton is giving away a Saskatchewan Roughriders coin from West Edmonton Coin & Stamp in celebration of the 2018 Grey Cup Festival! 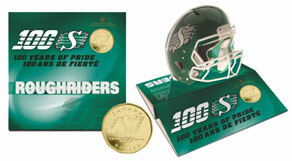 The gold-plated loonie commemorates the 100-year anniversary of Rider Pride and its contribution to creating the CFL. To enter to win this iconic keepsake, follow WHERE Edmonton on Twitter and watch for tweets about the contest! We will draw for the winner on November 23. Click here for an easy breakdown of the five-day itinerary!